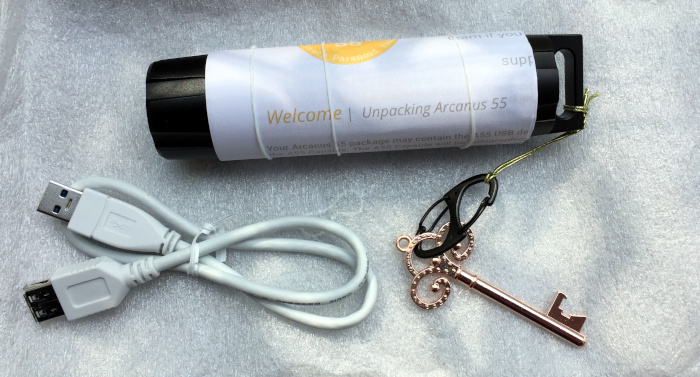 REVIEW – The Arcanus 55 Personal Wealth Safe (a.k.a. Privacy Paranoid Vault) is a combination of a sophisticated, encrypted 16 GB USB drive and a rugged, waterproof, electronically isolated vault designed to protect the USB drive and other small items. The Arcanus 55 Personal Wealth Safe (a.k.a. Privacy Paranoid Vault) is a combination of a sophisticated, encrypted 16 GB USB drive and a rugged, waterproof, electronically isolated vault designed to protect the USB drive and other small items. The isolation vault provides protection from crushing, water infiltration, and acts as a Faraday cage protecting the contents from damage or snooping from to electromagnetic fields. The Arcanus 55 vault is 15 cm long (including the loop) and 3.7 cm in diameter. It weight 129 grams. The encrypted USB drive has a metal case and is 9.15 cm long, 2.4 cm wide, and 1 cm thick. It weights 36 grams. The cap at the top is removable to expose a USB-A connector. 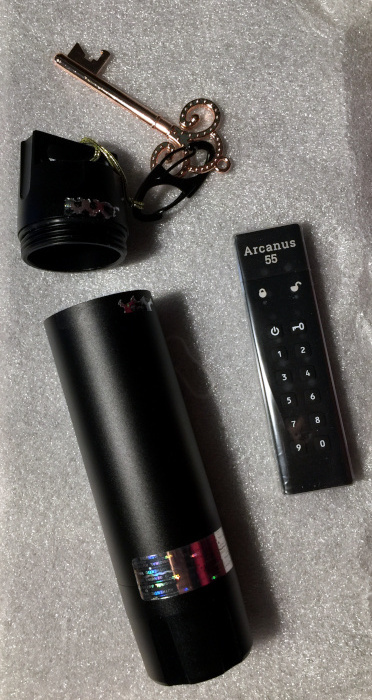 The Arcanus 55 system is designed to be the ultimate portable protection for your data by providing encryption for your data, physical protection through the use of a metal body of the USB drive, protection from environmental threats (water, dust, electromagnetic fields), and tamper-evident seals. This combination should be sufficient for the needs of most people’s data. It isn’t going to protect national secrets, but then national secrets shouldn’t be on a thumb drive. When I opened the package, I was confused to find no obvious USB drive. When I read through the quick-start sheet, I found that the drive was inside the vault which had tamper-resistant seals already in place. Breaking one of the seals, allowed me to extract the drive. Before using the drive the default security code must be reset according to the instructions on the guide. Once the security code has been reset, I removed the cap, entered the security code, and inserted the drive into a free USB port. I had some problems completing the reset of the security code and getting the drive to unlock. A quick email to Arcanus 55’s technical support address and an arranged phone call later, I was able to get the drive set up. The instructions were a bit unclear on the key sequences needed to unlock the drive. This has been updated in a new quick-start guide which will ship with new units and is available online. In addition to my initial difficulties getting the drive to accept a new security code, I also had trouble getting the drive to unlock. Both of these problems could be traced back to user error, rather than hardware or software failures. The first problem had to do with the speed at which I was entering the numbers on the keypad. I was informed that the presses have to be discrete with a brief pause between presses and not the rapid fire keying that I am used to with phones, keyboards, and ATMs. The second problem was incomplete instructions for the operation of the drive. Before the USB drive will recognize a security code, the key button must be pressed and only then will the code be accepted. A press of the key button submits the entered security code to unlock (if the code is correct) the drive. Data is stored in encrypted form and is encrypted / decrypted on the fly for added security. I was concerned that this would negatively impact the drive’s performance, but this ended up not being an issue. 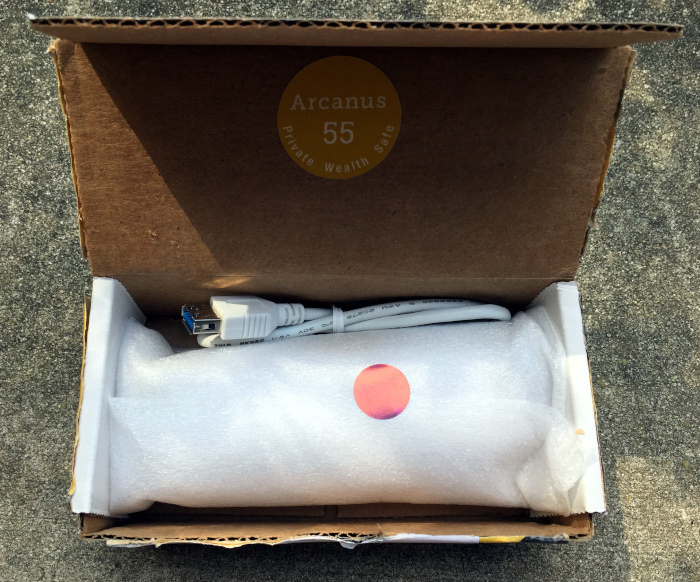 The Arcanus 55 USB key works at least as quickly as any of the other encrypted USB drives that I own (including drives from most of the major players). I did not perform rigorous read/write speed tests, but merely timed transfer operations to and from the Arcanus 55 drive and compared these to the same operations on other drives. I was also able to playback 1080p video from files on the encrypted drive using VLC media player. As an added layer of protection, you may install the included holographic seals over the joints where the caps screw onto the vault body. These seals are very difficult to remove without leaving a trace and serve as evidence of tampering with your vault. In the event that your drive is lost or stolen, the encrypted storage system will not allow your data to be accessed, even if the chips are removed from the USB drive. If you need to quickly erases the drive because you have forgotten the security code, or you are under duress and want to make sure that your data is secure, a quick process will erase the decryption key and provide a wipe of the drive indices. Your data is now inaccessible (even with the security key). The drive may be reused by repeating the setup routine and selecting a new security code. An important bit of information that was given to me during my technical support call is that if the unit has been left sitting without being plugged in for long periods of time (say “cold” storage), the unlocking functions and decryption systems may not work until the drive has been plugged in and the on-board power system has been allowed to recharge. Add a USB-C connector version or add a UBC-A (female) to USB-C (male) adapter cable. Since the product literature talks about securing the vault into your bag with a carabiner or similar method, the clip that is included in the package should actually be able to clip onto the hard point on the vault. The Arcanus 55 Private Wealth Vault system is more than adequate for my needs when it comes to protecting my personal information. We have stored copies of our important household and personal papers on the drive and we carry this when we travel in case of an emergency. We have left a copy of the security code with our lawyer (who also has copies of the documents as well). Where to buy: Arcanus 55, Inc. Source: The sample of this product was provided by Arcanus 55, Inc.